Iron Girl Seattle is a BLAST!!! I am still giddy about this race, and it was a 5K. Never in past 5K races have I been this jazzed days later... My good buddy Jess @ Blonde Ponytail wrote her Race Report, check it out HERE..
"It is OK you can try to run the 10K and if you get tired, finish the 5K." She was so sweet about it, and I sorta felt like a wimp in that moment, but I explained I could run the 10K but I preferred the 5K and switched my entry. Next we met Kit and chatted, this little lady is FANTASTIC!! She know how to put on a great event.. The expo was small and outdoors. I was a bit baffled that the Athleta booth was a "try on" booth and that they were not selling anything? Very STRANGE.. We got hungry so went across the street to the Greenlake Bar & Grill, the food was DELISH and the company even better. Jess and I click, I wish daily that she lived on the west side of the Mountains :) At one point we were intruded by a Bum, I am not kidding his Bum was hanging out of his pants, the bartender kicked him out but not before we got an eyeful and nearly upchucked our dinner.. Jess paid for Dinner, THANKS JESS, and we headed home for a 5:30 wake up.. I opted for Red, White and Blue (Team Sparkle HERE) Skirt to honor 9-11. The day before we had spotted a restroom on the side of the building, so we got in the SHORT line to avoid the Honey Bucket LONG line... Short line score!! No Toilet paper, UGH!! Oh well, you take the good with the bad. Next it was off to the Start Line, we were told it could get congested so we didn't waste any time. The music was FANTASTIC, keep the energy High.. There were FIT FIT FIT women stretching and warming up, I felt a little out of place but I HOPED I could get sub 7's for the 5K so I was in the right place. Next Lindsay HERE came up and introduced herself. 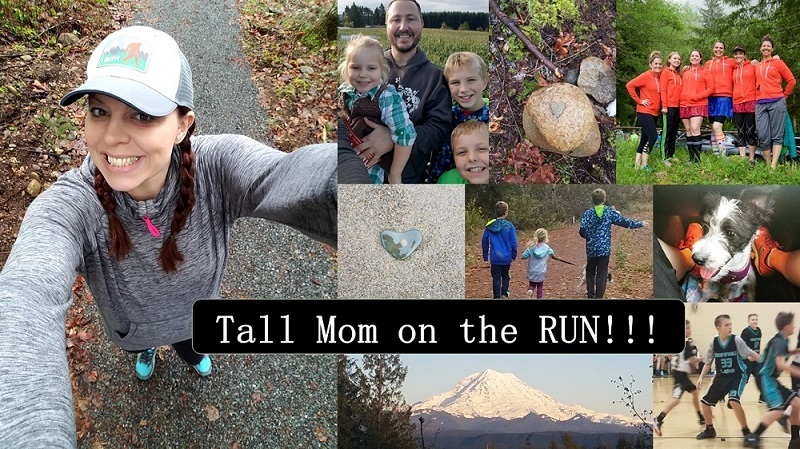 She is a local Blogger, I fell upon by reading her Nuun application..talk about inspiration, she is a Type 1 Diabetic with asthma and Runs!!! Amazing. Danielle came up to say Hi around that time also, so fun to have buddies to chat with while waiting. They told inspirational stories and introduced the Leader of it all Judy, she choked up as she asked us to recognize 9-11 in a moment of Silence. I fought back the tears as the bagpipes played, it was a lovely tribute with the flag waving and everyone quiet. A few more stretches and we were OFF. Jess's 10K plan was to chase me, so when I switched I told her to go 7:50-8:00, she is a GOOD listener, more on that later. Second Mile 7:21. I was surprised by the slower mile because I was TRULY giving it all I had. The scenery was pretty, near the lake with STRONG WOMEN surrounding and passing me :) What a TREAT!! I love love love all female races. There was no chance for a PR but I could try to squeak out a sub 23:00... I tried to get my heavy legs to turn as I struggled to breathe and clear my throat. I bet people around me thought I was a smoker, it was not my lungs it was ALLERGIES!! I could see the Finish Line, just then an itty bitty little gal passed me on the left, I did not have the legs to kick it up. But she stopped just after a line in the grass, it was not the Finish Line :( I sped up and passed just in front of a 14 year old girl, visor flying off as I sprinted...not proud of passing her, but she will know the FINISH LINE from now on..
A pair in matching shirts, the first had a #1 and her partner had #2 and #3 over her tiny baby bump. Little tiny girls crossing with their Moms. A girl about 12ish said to her Mom "Why did you make me do that?" Another little one went zooming across the Finish arms swinging and smile blazing, her poor tired Mom tried to keep up but her daughter was too excited!! The passion, excitement and joy from everyone!! We waited and I heard "Jess ----" and waited for me buddy. She had KILLED it and looked GREAT!! How DARLING is this little ATHLETE?? We talked with Judy, the leader of Iron Girl, and told her how much we enjoyed the event... Lindsay came up and had done GREAT, read her report HERE, she dissappeared before I could say goodbye. Next it was time to get Jess's results and settle in with some grub..they have catered breakfast!!! Jess got her timing printout which said she placed 4th in her Age Group.. UGH so close!!! WE wondered what the top 3 times were and decided to stay for that announcement to hear. I really enjoy staying for Award ceremonies so I was a happy camper. There were women as old as 80 and many named Phyllis. When people accepted their awards, a beautiful charm, the photographer was there to snap a photo, NICE TOUCH!! The announcer was fantastic and kept the energy high. Soon it was time for me to hit the stage.. Showing off my Bling.. Note the little girl in the background, she won her age group and was WAITING to get her prize, clearly not jazzed to be waiting. It was a LONG ceremony but I appreciate that they gave top 3 awards for every Age group. It was time to pay attention to the 10K 30-34AG, They said the 3rd place then announcer said "Jess" we were clearly SURPRISED!! She had taken 2nd in her first 10K!!! Guess she did not need to chase Tall Mom a$$ to do well. Matchy matchy in her Iron Girl Pink outfit. so PRETTY!! What a FUN day we had. I would recommend Iron Girl events to anyone wanting a GREAT first time 5K or 10K experience, or to be re-energized with racing. You get a MEDAL!!! After the awards we went to Chelsea's HERE to get clean up, I had a baby shower for Short lawyer a few hours later. It was a blast to see my UW friend's house and hang just a bit longer. Also got to chat with Danielle, a local runner, come to find out we work at the same company. Thanks Chelsea for letting me wash off the grime!! Check to see if there is an Iron Girl event near you HERE, it is not just Triathlons!! Sounds like a fun race. Congrats to both of you on your age group awards! great job placing, and very festive outfit. Sad I had to miss this. i'm constantly amazed with how fast your splits are! Your race reports always floor me b/c you remember EVERYTHING!! Every day I wish I was on the west side, so I could see my Tall Buddy more often! I feel like I have know you for years! Congratulations on placing, thank you for coaching me, and inspiring others along the way. You always "pay-it-forward" and touch so many lives in the process! Hugs! It was a great event, one to add for the 2012 race calendar for sure. as always, i love your race reports! Gonna click and see if Iron Girl events come anywhere near me -- sounds fun! You are amazing! 3rd with crampy allergy biz going on…awesome! Wondering how fast you'd be after speedwork and Claritin ;-) Great recap …it looks like so much fun! I have no Iron Girl events near me, but there is a Dirty Girl series for trail runners! Congrats on your race!! I wish we had one near KY! I have never done a women's only race. Seems like it would be a lot of fun!